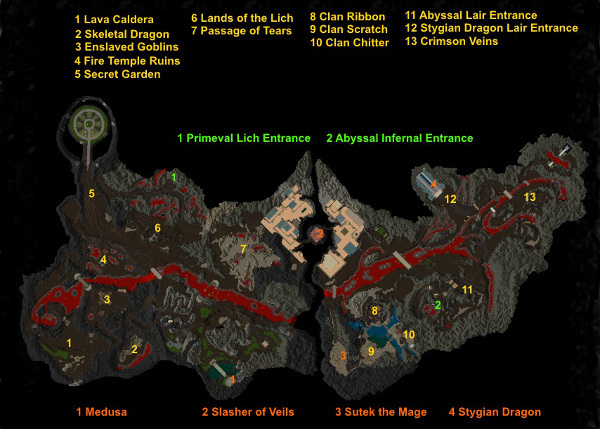 Mini champs are spawn areas within the Stygian Abyss dungeon composed of two to three groups of monsters (in increasing levels of difficulty), with a final ‘champion’ monster called a [Renowned]. Renowned are a considerably stronger version of a familiar mob, something like Ilshenar paragons, but on a higher scale. Mini champ areas are marked in yellow on the above map. 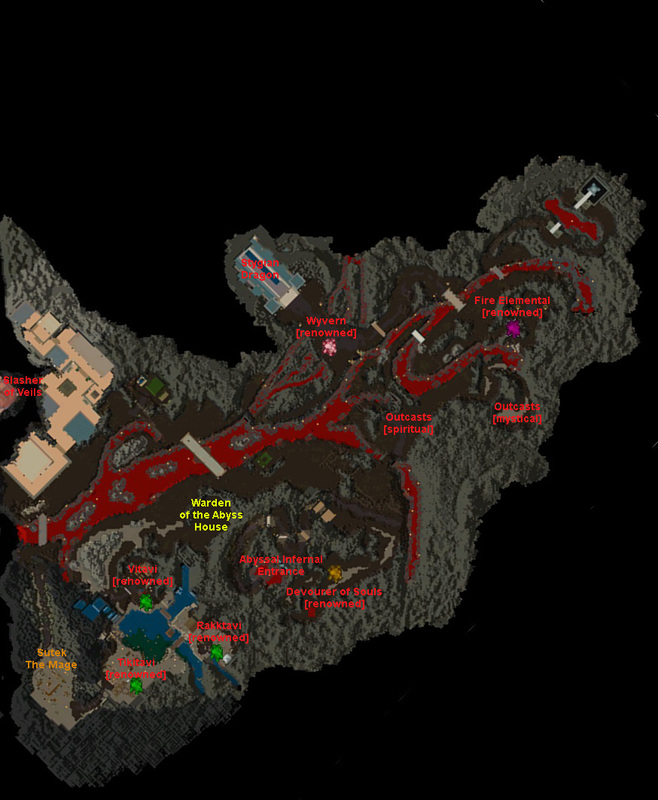 Orange denotes other creatures of interest found in the abyss, green marks the entrances to the two pvp champion spawns. The map can be expanded into east and west sections with further information by clicking on each half of the image. Move your mouse off of each of the larger images to see the terrain detail without labels. Click on the large map to return to this page. 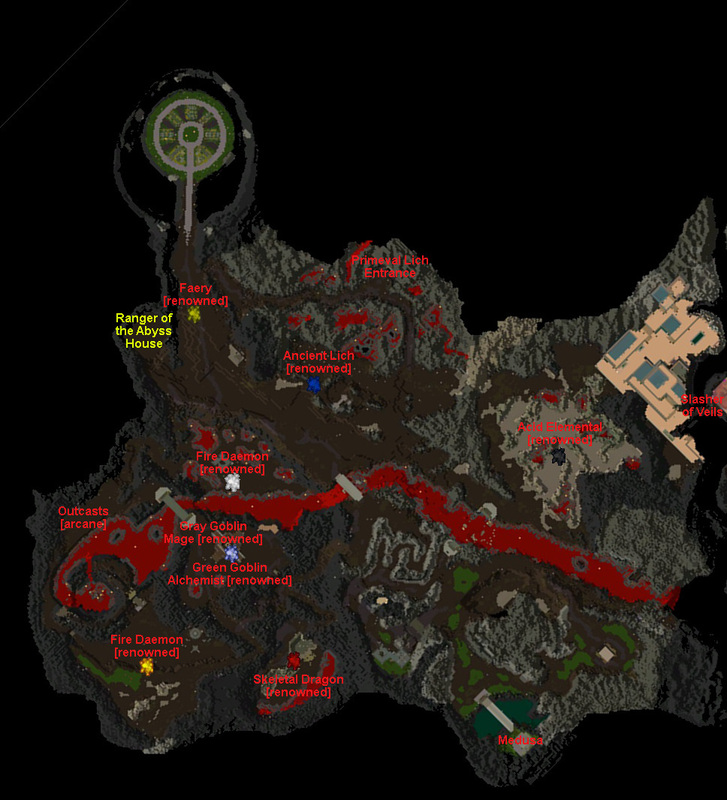 The three spawns in this area differ in that each is accompanied by a low level spawn which does not give essences or other ingredients, with the exception of Clan Scratch Savage Wolves which may give reflective wolfs eye. These creatures spawn continuously before, after and during all the mini champ levels. Other Ingredients: Abyssal Cloth, Arcanic Rune Stone, Crushed Glass, Crystal Shards, Crystalline Blackrock, Delicate Scales, Elven Fletching, Powdered Iron, Seed of Renewal. Level 4: Devourer of Souls [Renowned].